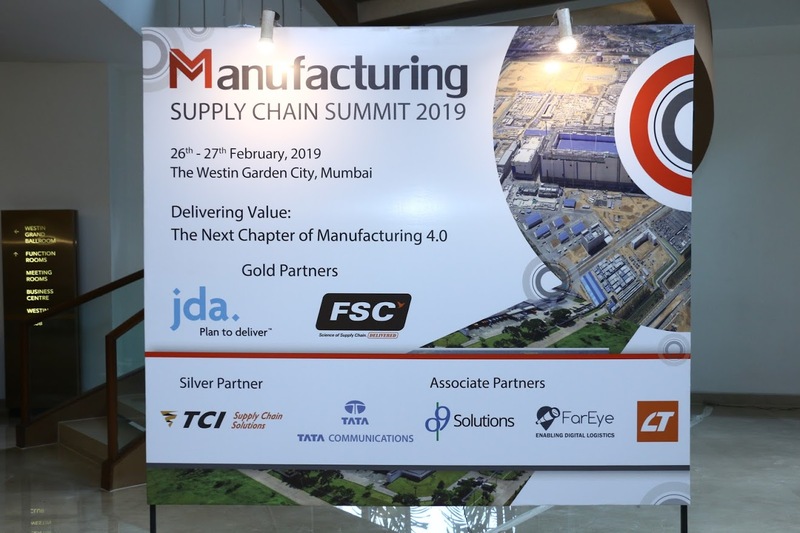 The 8th Edition of Manufacturing Supply Chain Summit, offers an integrated portfolio of leadership networking, information and professional development sessions for industrial executives in India. Our mission is to help senior executives define and shape a better future for themselves, their organizations and the industry at large. This platform also recognizes individuals and companies who have excelled in their endeavors over the past 12 months. Be prepared for the future state of manufacturing where new rules of leadership will prevail. Gain applicable insights into successful employee engagement for a new generation. Feel the pulse of the manufacturing state of business while gathering ideas of the future technologies, trends and user expectations. Find solutions to real business problems by interacting with your peers and gaining a view into the future of manufacturing and supply. Success today depends upon a deft marriage of new business models and game-changing technologies. Get inspiration and imagine highly intelligent, agile information-driven factories and dynamic teams that can respond rapidly to change. The culture of the Summit has been described as "welcoming, engaged and passionate". Benefit from the intimate setting of the Summit, which inspires openness and sharing about the strengths and opportunities on others' journey so far. Collaborate, Collaborate, Collaborate: Share best practices and philosophies with like-minded leaders, learning what’s working for them, why is it working and how it can work for you. Relax, Have Fun and Make New Friends: Build the foundation for long-lasting relationships with world-class manufacturing professionals. Keep your contact list building and engines at high rev, while enjoying unique networking events throughout the program! Stay Ahead of the Technology Curve: Meet with top manufacturing technology innovators and take advantage of their services to improve your bottom line. Mr. Anil Singh, Operations Manager - Hyderabad & Lead, Water Paints - South Asia, AkzoNobel India Ltd.
Mr. Navneet Agnihotri, HOD - Quality Assurance, Orient Electric Ltd.
Mr. Vaibhav Kulkarni, Works Head, Marico Ltd.
Mr. Anjan Kundu, Head - Supply Chain Transformation, Hindustan Coca-Cola Beverages Pvt. Ltd.
Ms. Rajashree Rath, Associate Vice President, Reliance Industries Ltd.
Mr. L Prakash, Vice President, Head - Hydrocarbon SCM Platforms, Reliance Industries Ltd.
Mr. Bhavesh Nainani, General Manager & Subject matter Expert - SCM IT, Zydus Cadila Healthcare Ltd.
Mr. Milind Majali, Senior General Manager (Corporate Logistics), Kirloskar Oil Engines Ltd.
Mr. ASR Prasad, Head - Center of Excellence, Future Supply Chains Solutions Ltd.
Mr. Satyendar Makan, Head SCM - Convergence Business, Sterlite Power Transmission Ltd.
Mr. Aman Sinha, Senior General Manager - Power Systems, Cummins India Ltd.
Mr. Kapil Maini, Head - Global Business Services, Nokia Solutions & Networks India Pvt. Ltd.
Mr. Pradeep Mishra, Group Global Head - Strategic Global Sourcing, Procurement, Commercial, Supply Chain, New Process technology & Business Development, United Phosphorous Ltd.
Mr. Somnath Chatterjee, Head - Procurement & Logistics, ITC Ltd.
Table 2 : Driving change through leadership - "What does great leadership look like?" Mr. Pradeep Naik, Senior Business Development Manager - GTM Partner Ecosystem (Mobility & IoT Solutions), Tata Communications Ltd.
Mr. Purushottam Tatkar, Head - Supply Planning India, Henkel Adhesives Technologies India Pvt. Ltd.
Mr. Royston Fernandes, Head - Analytics & Continuous Improvement, Cipla Ltd.
Dr. Aravindan Raghavan, Corporate Head - Global Operational Excellence, Syngene International Ltd.
Mr. Surendra Gupta, Head - Supply Planning & Stock Control, Supermax Personal Care Pvt. Ltd.
Mr. Vijay Shetty, Head - Distribution & Logistics, BASF India Ltd.
Mr. Rajesh Bhogavalli, Head - Supply Chain, Essel Propack Ltd.
Autoplant System India Pvt. Ltd.
Mr. Aravindan Raghavan, Head - Operational Excellence, Syngene International Ltd.
Mr. Ashutosh Tripathi, Vice President & Plant Head - Nagpur Plant, Mahindra & Mahindra Ltd.
Mr. Rajesh Mohata, Director - Procurement & Supply Chain Management, Cairn Oil and Gas, Vedanta Ltd.
Mr. Pratap Singh Chauhan, Vice President - Logistics, Trident Ltd. The event was indeed splendid with participation from across the various industries. The arrangement and Venue were excellent. The Speaker sessions was indeed relevant and apt to the Summit. We look forward for even better participation from next time onwards. The Stalls were very nice, the food was fantastic and the team in which I was part of the speaker was just fabulous. All presented very well with examples from their domain and those 90 min flew away just like that. Kudos to all the team members and to you specially! Mr. Vijay Ganapa, Head - Materials & Logistics, Hindalco Industries Ltd. The program was fantastic and very nicely organised. Would love to be part of your upcoming programs. Please keep me posted. All the best. Mr. Naveen Goel, Head - Supply Chain Finance, IndusInd Bank Ltd.
Congratulations for organizing successfully a very meaningful supply chain event once again. I really found the choice of topics very apt and panel discussions very insightful. What caught my attention this time is table discussions in small teams on different topics, which helped us in bonding with participants. I truly enjoyed interacting with some of the panelists and audiences. I look forward to more such events in the future.
" A Big thank to Harish and entire Kamikaze team for organizing an engaging conference at 8th Manufacturing Supply Chain Summit. What I liked the most is the format of the conference through panel discussions. Audience presence was from diverse industries. The discussions are very relevant for designing the agile, flexible supply chain." Mr. Supratim Halder, Associate Director, Operational Excellence, Dr. Reddy's Laboratories Ltd.
At the outset, I wish to thank you for inviting me to moderate a very interesting panel discussion. It was an absolute pleasure and privilege to be a part of an esteemed panel. The event was very well conceptualized and curated; the choice of topics were relevant in terms of their width, coverage and depth. The themes revolving around technology, manufacturing 4.0, supplier relationship management, refined supply chain and S&OP models to name a few – were extremely thought provoking. The overall arrangements were excellent, as always. I wish to be an integral part of future panel discussions going forward. Thanks again to Harish and his team for giving us a great platform to exchange and share current thoughts and ideas related to operations, supply chain and logistics management. Mr. Sunil Bharadwaj, Head - Strategy & Supply Chain, Lifestyle Business, Raymond Ltd. Thanks for providing the platform to express our views & opinion on the subject of Procurement which is certainly catching the eye of the corporate world. The ambience was excellent & the audience was very participative and interactive. It was a great experience to be part of this summit and knowledge and insights shared by Panel and speakers were really valuable. Summit was nicely organised including food and awards night arrangement. Would surely like to be a part of such summits in future too. The panels were perfectly conducted with rich discussions from Industry Specialists and the individual presentations from various speakers were equally enriching. Mr. Avnish Naik, Head Warehouse - Suiting Manufacturing, Raymond Ltd.
Mr. Pradeep Sharma, GM - Supply Chain, Sun Pharmaceuticals Industries Ltd.
Mr. Hemant Kumar Sood, Head - SCM, J. K. Helene Curtis Ltd. Thank you for organising full of engaging and networking session thru Supply Chain Summit and giving us space and platform to share our thoughts, helping to enhance our knowledge on supply chain. It was a wonderful and well organised event, giving opportunity of interacting with Supply chain Leaders from different industries. Mr. Satyendar J Makan, SCM Head - Convergence Business, Sterlite Power Transmission Ltd.